July 26, 2018 — Over the past few days, Israel has denied entry and deported human rights defenders, researchers and an eyewitness delegation, citing their support for Palestinian rights. Ana is being punished for her effective role in convincing elected officials, municipalities, local councils, and businesses and community organizations across Spain to respect human rights and commit to doing no harm to Palestinians suffering from Israel’s racist policies. Israel has barred me and others from entry just days after it effectively adopted apartheid in its constitution. All states, including Spain and the European Union, should respond in ways that hold Israel meaningfully accountable for its systematic human rights violations. In response to its entry bans, Spain and the European Union should at the very least deny entry to all Israeli settlers and all Israeli soldiers for being accomplices in Israel's apartheid and war crimes. 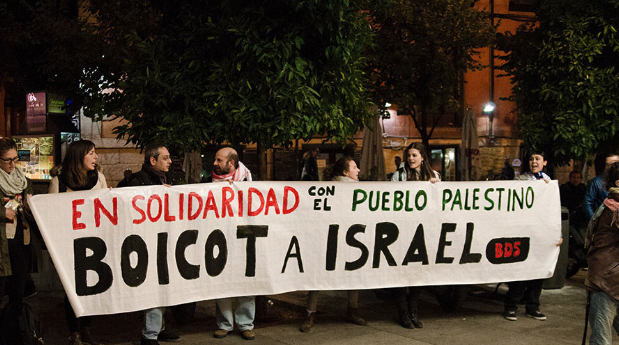 The BDS movement's response to Israel’s escalating repression and deportations will be to create more Apartheid Free Zones, in Spain and beyond.